fantastic views over the Staffordshire countryside. 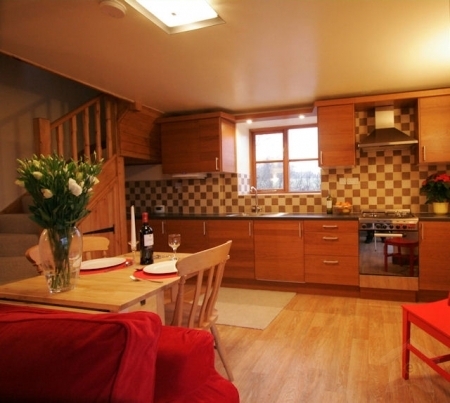 Accommodation is fully equipped with high quality fittings and appliances. We generate our own electricity and we use energy saving appliances wherever possible. We installed a wind turbine in 2008. We have plenty of open space for children to play and a trampoline that most children will enjoy. Adult supervision is required at all times. Nearest shops are in Tean 1 mile away including butcher, baker, co-op, pharmacy, doctors surgery, post office, petrol station, fish & chips, Chinese takeaway and pubs. Within our local area there are plenty of country pubs and restaurants that will provide you with a range of meals to suit taste and budget. The market town, Cheadle is about 3 miles away. Here you will find banks, Chinese, Indian restaurants, pizza takeaway and more shops. A little further are the Potteries, Derby, Nottingham, Telford and Birmingham that will provide you with great shopping and entertainment.